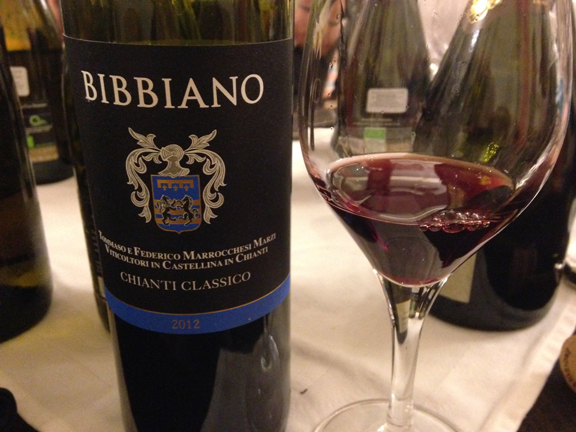 Above: I really loved the Bibbiano entry-tier Chianti Classico, which I tasted for the first time at the Gambero Rosso Road Show tasting in Mexico City. This is my kind of Chianti… superbly grown Sangiovese with a touch of Colorino, vinified in cement. Utterly delicious. In the late 1960s and early 1970s, Pier Paolo Pasolini wrote famously in verse and in essays about Italy’s disenfranchised youth. As the much of the country basked in the “economic miracle” that emerged nearly two decades after the Second World War, many southerners were left behind by the country’s newfound prosperity. In his unforgettable poem “Il PCI ai giovani” (“The Italian Communist Party [belongs] to youth”), published in the wake of the 1968 Battle of Valle Giulia, he wrote of the “police, children of the poor.” These were the economically challenged young people of southern Italy who escaped their depressed regions by joining Italy’s paramilitary police force, the Carabinieri. I was reminded of this poem and Pasolini’s myriad essays on the widening economic inequality in 1960s and 1970s Italy by something that a young Italian wine professional said to me in Mexico City last week. Originally from Abruzzo, he has an import company there and works primarily with Italian estates. 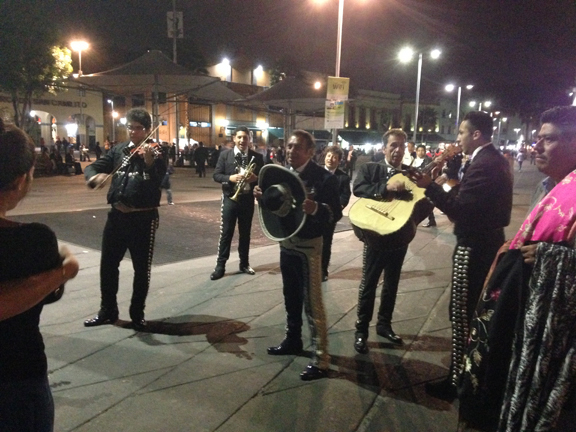 When I asked him if he liked living in Mexico, he looked at me squarely. L’Italia non fa impresa, he said flatly, Italy doesn’t do business. In other words, there isn’t a business-friendly culture in Italy that allows motivated young people like him (he was in his early thirties, I gauged) to embrace an entrepreneurial spirit. Mexico — not a country that many would count among the world’s most prosperous — is a better place for him to do business, it seems. 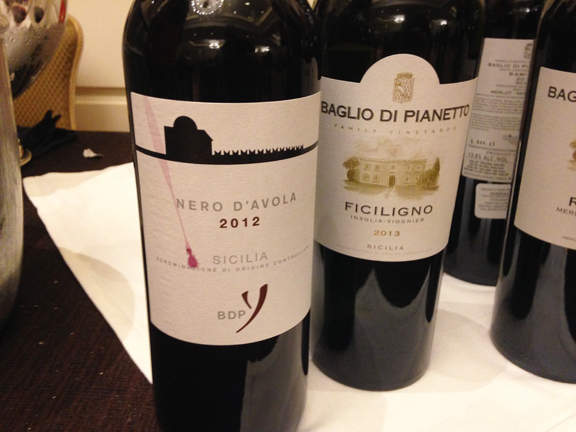 Above: another wine I really loved was the Baglio di Pianetto entry-tier Nero d’Avola. The winemaker told me that the consulting enologist is Marco Bernabei, the son of the legendary Franco Bernabei. It’s made from organically farmed fruit and is vinified in temperature controlled stainless steel. “It’s actually a very simply made wine,” he said. And its transparency and focus were delicious and refreshing on the palate. 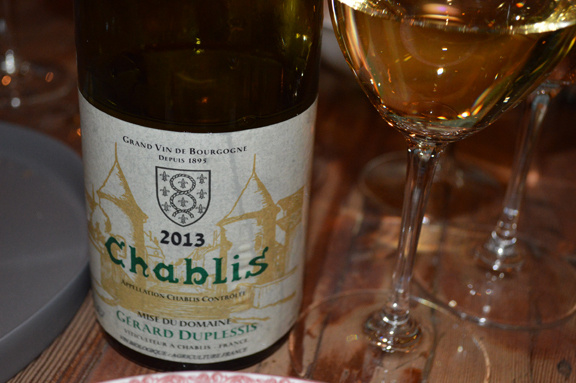 A great by-the-glass. After he left my stand, I turned to the Tuscan winemaker pouring next to me and we talked about the bleak job horizon for young people today in Italy, where there is a nearly 50 percent unemployment rate for people under 25. Grape growing and agriculture in general are one of Italy’s greatest resources and exports. Yet the country’s current economic stagnation and its burdensome and behemoth bureaucracy leave little room for economic mobility for the new generation of wine professionals there — like my new friend from Abruzzo. Everywhere you turn in Italy, wine appreciation is less and less popular among young people and the wine trade is increasingly sustained and supported not by domestic consumption but by exports. 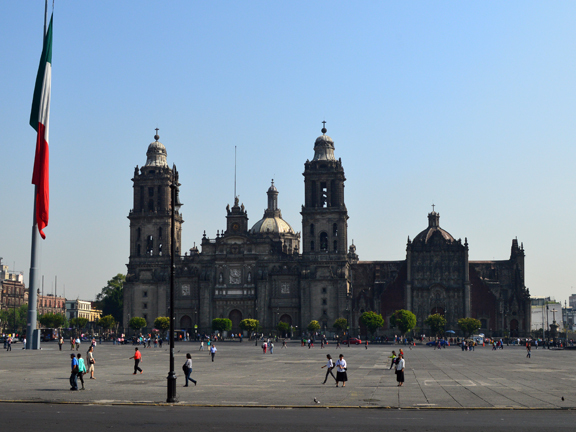 It struck me that day in Mexico City that the wines are the children of the poor. They must abandon their birthright and travel far from their villages to sustain themselves — just like the young man from Abruzzo. Sadly — tragically, really — this is the reality faced by a legion of young wine professionals in Italy today. 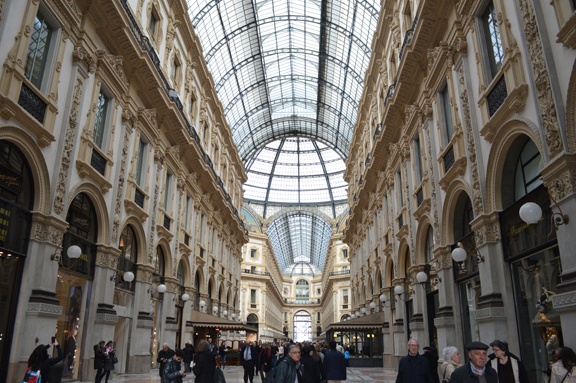 As I prepare to leave next week for my May trip to Italy, I wanted to share details on a couple of tastings and events that I’m really looking forward to attending. The first is the Asolo and Montello consortium tasting on Sunday May 10 in the historic center of Asolo. 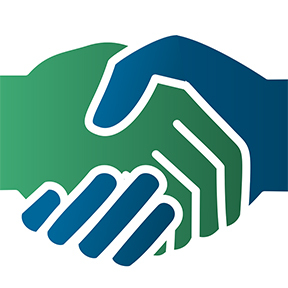 Unfortunately, the Consortium hasn’t published any more details than the image above. But as far as I know, you can just show up and taste without registering. Even today, many U.S. wine professionals are aware that Asolo — one of my favorite places in Italy — is part of the Prosecco DOCG. They don’t make as much wine there as they do in Valdobbiadene, Conegliano, and the valley floor of Treviso province. But they make some of the best expressions of Glera imho. The wines tend to be saltier than their cousins to the east and that’s the way I like it. The first ever TerroirMarche event on May 16-17 in Ascoli Piceno is going to be a game-changer. Verdicchio dei Castelli di Jesi and Verdicchio di Matelica are among the most promising appellations in Italy right now. Italian wine writers have been raving about Verdicchio and its much deserved place among the great whites of the world. The only thing that’s been lacking has been proper visibility of the wines and the people who make them. And the newly formed TerroirMarche group is working to change that. I’ll be in Ascoli Piceno as an observer and taster and I’m looking forward to the five seminars, one of which will be lead by Walter Speller among other Italian wine luminaries. 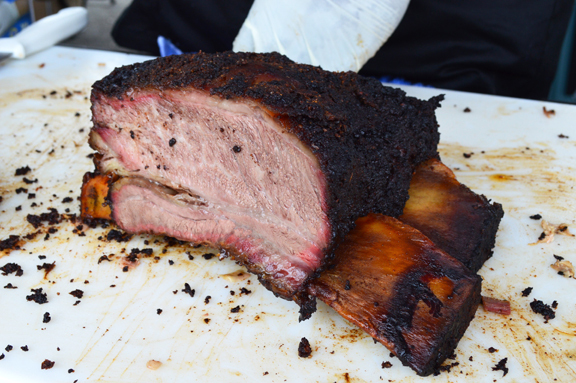 Yesterday I managed to snag a press pass and sneak into the Third Annual Houston Barbecue Festival. The event was co-founded by Houston Chronicle barbecue columnist Chris Reid, my good friend here. This year’s gathering featured 23 Houston-area smokers according to its website. While Lockhart in Central Texas is considered the “barbecue capital” of Texas and Austin continues to grow as a hipster barbecue mecca, Houston is emerging as another mandatory stop on the Texas barbecue trail. In the last five year or so, many new artisanal smokers have appeared and “cult bbq” — with its early-morning waits and long lines — is now an established phenomenon here. 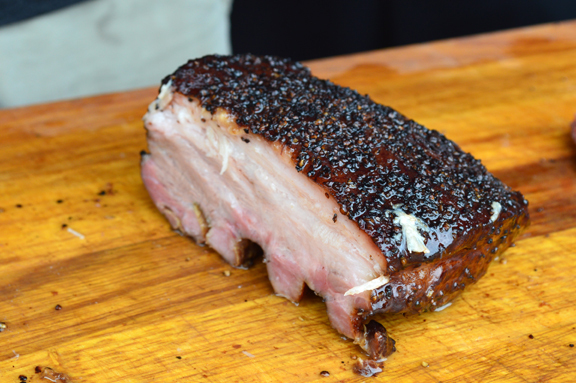 That’s smoked pork belly by CorkScrew, above. I didn’t visit every stand but CorkScrew’s was my number one for taste and presentation. 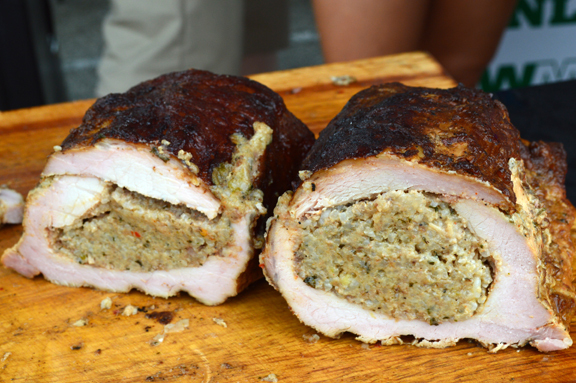 I loved the Boudin-Stuffed Pork Loin, above, the best thing I tasted at the festival. 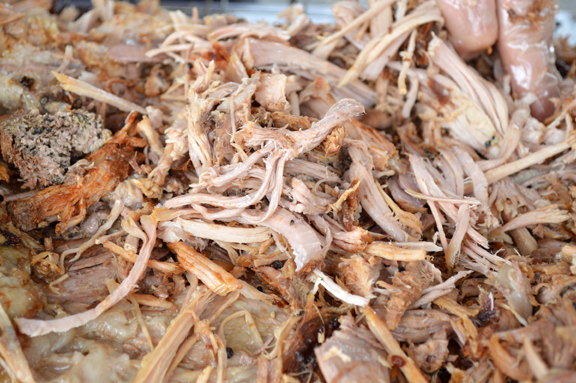 Bigger is often considered better in Texas barbecue. That’s the Brooks’ Place beef rib, above (the cut is often called a “brontosaurus rib,” even though it is now believed that the brontosaurus never actually existed). I overheard one of Houston’s highest-profile food writers say that Patrick Feges’ pulled pork, above, was the best thing he tasted yesterday. 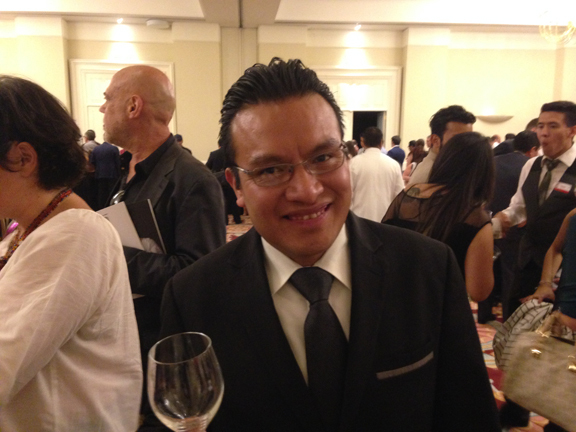 Mexico, a new frontier for Italian wine? 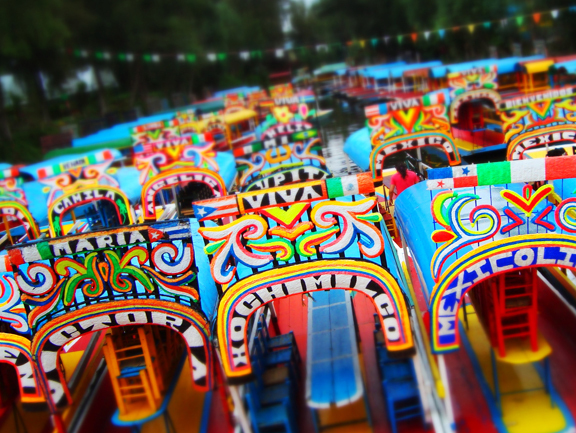 ¡Viva el México! Thank you to all the Mexico City wine professionals who came out to taste with me yesterday! A note to wine professionals: If you ever want to be the most popular table at a wine tasting, make sure you’re pouring Franciacorta! Yesterday found me in Mexico City, pouring wine at the Gambero Rosso Top Italian Wines Road Show tasting for a Franciacorta Consortium member winery. I was really impressed by the positive reception for the wines and the high caliber of wine professionals who tasted with me. But the thing that really surprised me was how many of the attendees knew Franciacorta and its place in the panorama of sparkling wines from around the world. Repeatedly, I had people come to my table and tell me that they loved Franciacorta and the overwhelming majority of wine professionals who tasted with me knew where and how the wines are made. Oscar, the gentleman in the photo above, works as the wine director at the St. Regis Hotel on the Paseo de la Reforma — one of the city’s swankest neighborhoods. He told me that as a rule, the St. Regis wine list features only Champagne and Franciacorta in its sparkling section. No Prosecco, for example, he told me. Click here to continue reading my post today for Franciacorta, the Real Story. ¡Vamos a los tacos! was what my Mexican friends used to say back when we were in high school together in San Diego. Just like the midnight spaghettata in Italy, a late-night taquería after an evening of drinking was and is a cherished ritual. 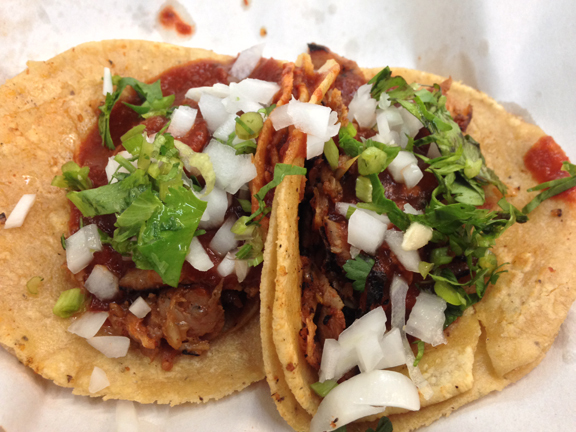 It’s hard to imagine — at least in my life — a dish that inspires greater nostalgia than tacos al pastor. On our friend Mai Pham’s recommendation, I visited the classic Borrego Viudo last night on the earlier side of the evening (after all, I’m not 17 anymore!). There’s really no other way to say it: this place was simply awesome. From the way the parking attendants cheerfully greet you to the polite, dutiful service of the tidy waiters who carry literally ten plates at a time, this joint is one that continues to stand the test of all time. 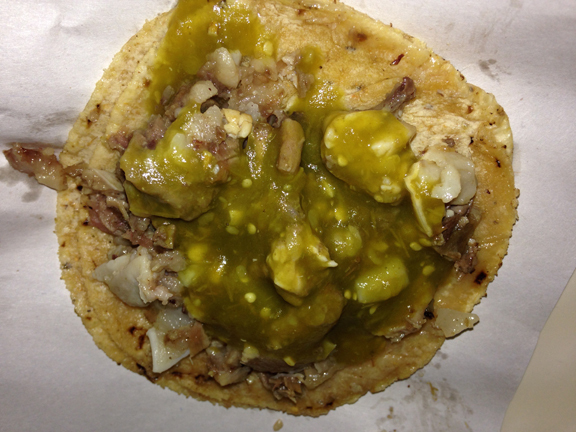 Those are the tacos al pastor above (see the carver in the video below). 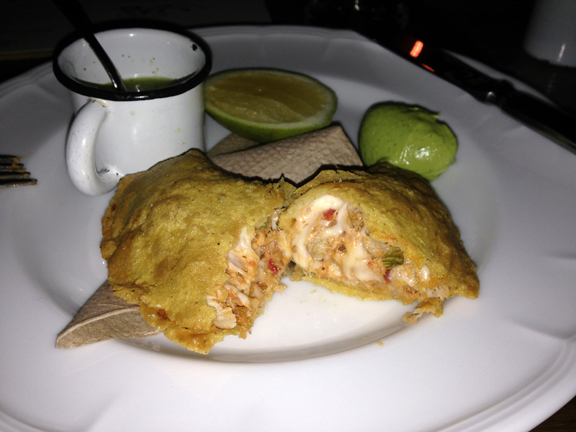 This was a taco de cabeza, two tortilas de maíz filled with head. It’s not hard to understand why Mai insisted that I visit this place. It was joyful and brimming with all kinds of people, young and old, families and friends. I was there on the early side, around 7:45. But by the time I left, there were so many people that the parking lot was full of people eating in their cars (the servers will wait on you in the parking lot as well). Heading out today for Mexico City where I’ll be pouring Franciacorta and Verdicchio dei Castelli di Jesi tomorrow for my client Barone Pizzini (click here for event details). It’s never easy to say goodbye to my girls but I have to admit that I am really looking forward to this trip. I haven’t been to Mexico City since I was a teenager and am really excited about my eating itinerary there (thanks again, Mai!). 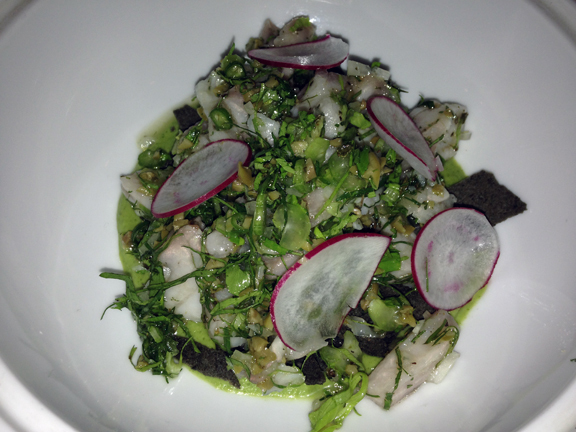 Last night, I finally made it to Oxheart in Houston, one of the most talked about and lauded restaurants in the city. And my retard wasn’t just due to my busy travel schedule: Oxheart is a small restaurant with roughly 30 seats and because of its overwhelming popularity among Houstonians and visitors, it’s extremely challenging to get a table there. If you’re reading this it’s more likely than not that you don’t need me to tell how wonderful owner/chef Justin Yu’s cooking is. He began racking up national accolades and media attention as soon as he opened the restaurant three years ago or so. And two years ago, Pete Wells gave the restaurant a glowing review in the Times. And Justin, his kitchen staff, and his waitstaff delivered on every level. Above: a brilliant pairing for the gulf shellfish and crawfish (previous photo), recommended by our waiter and authored by Justin Vann, one of the city’s leading wine professionals. Scores of other writers — local and beyond — have written about the originality and vibrancy of Justin’s locavorism and his boundless world view. It seemed that every dish spoke to his approach in fusing readily available wholesome ingredients with cosmopolitan cooking techniques and combinations. 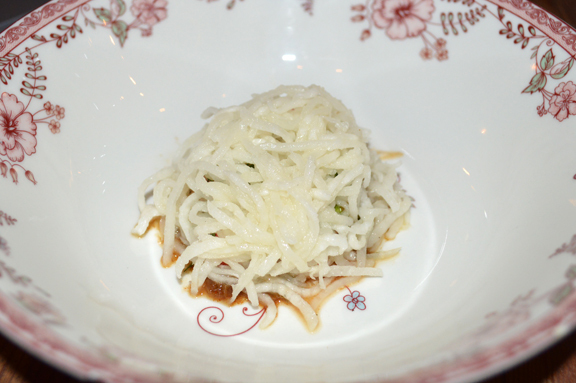 The smoked pork with porc thailande (below), for example, was brilliant. 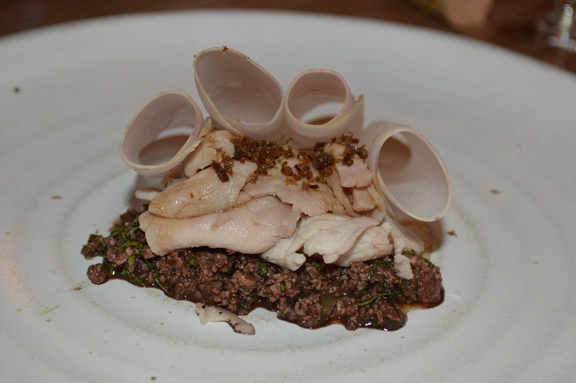 Above: “lightly smoked Red Wattle pig warmed in pork fat, with porc thailande, turnips, and fermented mizuna. But the thing that really turned me on about his restaurant was the utter absence of affectation. The staff was so polite and so gentle in explaining the complicated and unusual dishes. They never talked down to our table nor did they make us feel the burden of privilege (there is no à la carte dining there but the prix fixe was very reasonable at $74 per person). Their attitude was so refreshing: in a world where tongue-piercings and haughtiness seem to go hand-in-hand with haute cuisine, the Oxheart staff made us feel at ease and comfortable. I was really impressed by this. 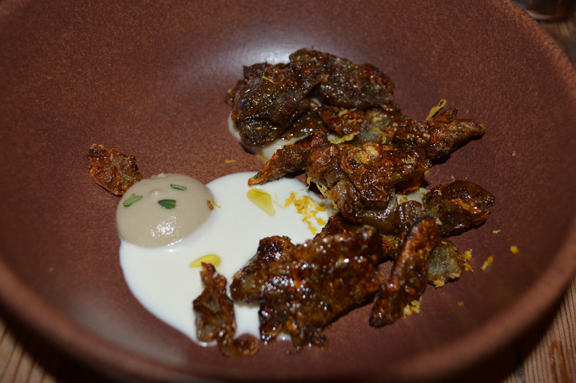 The other thing that I loved was the wholesomeness and transparency of flavor in Justin’s dishes. In so many “high-concept” restaurants like this, chefs seem to tend to transform the flavors of the ingredients. On one level Justin’s cooking is extremely complicated with combinations that would seemingly drag the diner in multiple directions (even geographically). But Justin’s food championed the materia prima without masking or morphing it. I loved that. In the same way that a great poet forges a new language by combining the words in the dictionary in a unique and newly meaningful way, Justin has — in my view — forged a new and unique culinary parlance.